I know what you’re thinking…she sure doesn’t have very good organization in her craft room! 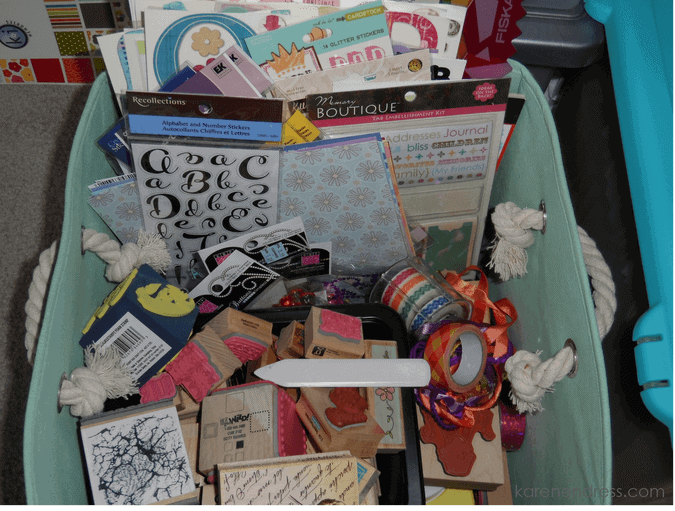 And I agree, throwing stamps, stickers, alphas, trims, washi tape, bling, paper & ephemera all in one canvas bin wouldn’t be the ideal organization. These items, though, will soon be in some flat rate boxes on their way to Colorado. I recently learned from this video that a public high school teacher in Denver will be teaching a scrapbooking course in her science-oriented school and is asking for donations. They will be doing scrapbook layouts, mini-albums and cards, but only have a small budget from the school for some tools and a few other items. Many of the students come from low-income families and can’t afford to buy supplies themselves. 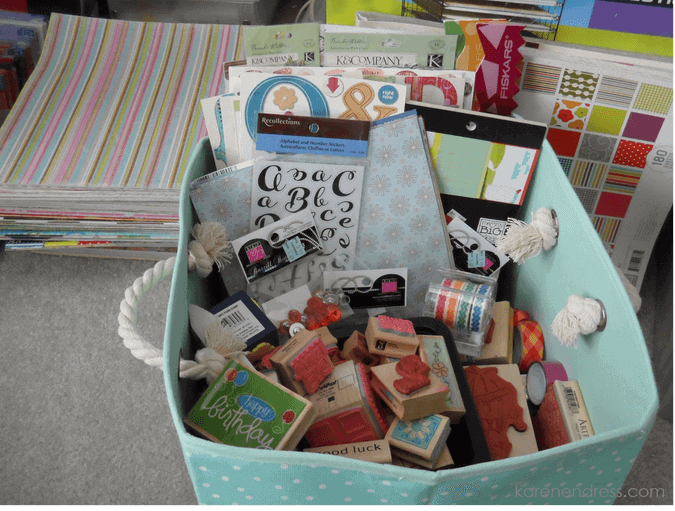 I had already started a small reorganization project and had set aside some punches, stamps and other items when I found out about this donation opportunity. Once I knew, I decided it would be the perfect time for a full-on craft room purge. 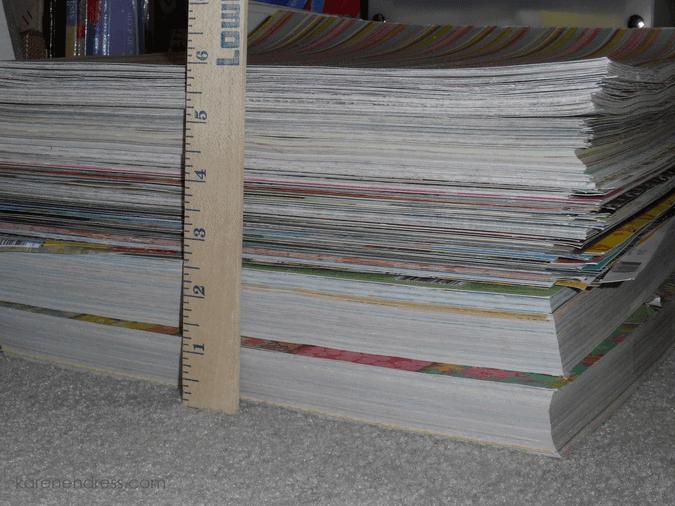 I went through all my Iris cases of patterned paper & cardstock as well as about eight large paper pads and came up with this six inches of paper to donate. I’m about halfway through my ScrapRack and to my shame I am still finding things I’ve never used or haven’t touched in years. Someone may as well be using these crafty goodies and I’m glad I ran across Nicole’s video to show me a place where they can all find a good home!! If you are looking for a good excuse to purge old items and make room for the new, please check out the video or just send scrappy donations to: DSST Stapleton High School, ATTN: Angie Turek, 2000 Valentia St, Denver, CO 80238. Angie is asking for your return address as well so the class can send you a thank you 🙂 All for now, new card post coming soon!